After more than a year of stump speeches, campaign rallies, political ads, debates, pundits and pollsters, Americans finally head to the polls on Tuesday to cast their vote for the next President of the United States, Members of Congress and state and local officials. No matter the outcome of the election, there are two issues on the minds of many voters in every state and across all political spectrums: taxes and health care. One reason these issues are so troubling to voters is the Health Insurance Tax (HIT). The HIT is a $130 billion tax that disproportionately hurts the 28.8 million small business owners across the United States and the 56.8 million workers they employ who desperately want to provide and depend on quality healthcare. Is estimated to cost small businesses $500 per employee in higher premiums annually. For small businesses, this can cripple their ability to provide benefits and hire more employees. 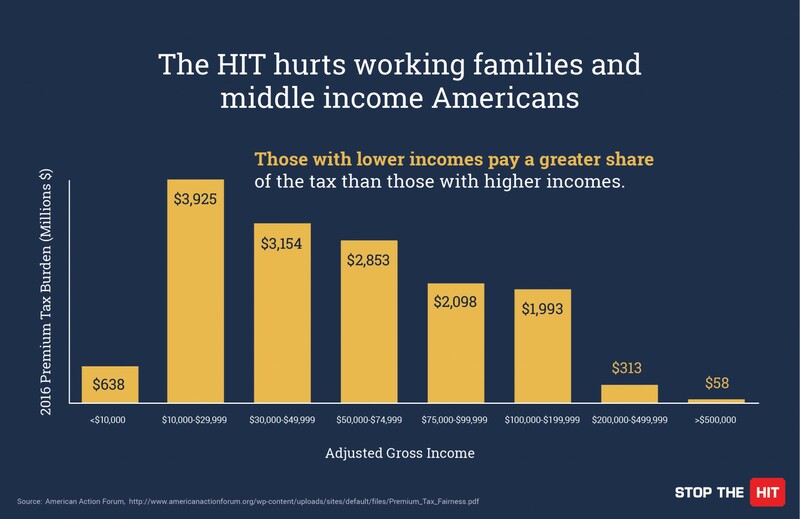 Unfairly targets low and middle income Americans as nearly half of the entire HIT is paid by those with incomes between $10,000 – $50,000. Additionally, this tax hits at an especially hard time for small business employees who are already seeing a significant decrease in health care coverage. Helping to provide HIT relief is a fundamentally bipartisan issue, and we applaud the approximately 400 Members of Congress from both sides of the aisle who voted last December to suspend the impact of the HIT for one-year (2017). However, unless Washington takes further action during the Lame Duck session, the tax hits back in 2018, returning at an even higher rate. From New York to California, Montana to Hawaii and every state in-between – small businesses are the lifeblood of the American economy. Candidates on both sides of the aisle can speak directly to them and their bottom lines by taking a stand against this misguided tax and providing further relief from the HIT for 2018. Below is a breakdown of the number of small businesses in all 50 states and the number of people they employ.